Five years ago Yu Yong-gi arrived in Jeju and hiked all the way around the Olle Trails. Like many, he was inspired by the beautiful nature of mountain, ocean and clean air. He purchased a two-story duplex on the shoreline at Beophwan Port just south of World Cup Stadium. With some serious remodeling and lots of colorful paint, he transformed it into a gardened coffee shop with a staggering market display of international crafts that he collected over many years from around the world. He said not only Koreans appreciate pretty little knick-knacks and artistic items. He created an integrated art-and-culture space because, he said, a plain coffee shop along the Olle Trail is not really competitive. Je's Story opened two years ago. The name has three meanings: "Jeju's story" plus "My story" plus "The whole story." Beophwan Port has long held a flea market outside, across the street from where Je's Story emerged, but it dwindled in cold or rainy weather. Five months ago Mr Yu decided to make available the wide second floor of his coffee shop, and invited the sellers inside to sell their hand-crafted wares. Thus emerged Sorang Jang (소랑장) which is an affectionate way to spell "Market of Love." Every second and fourth Friday the market runs from 11am to 3pm and anyone with handmade items can apply to participate. 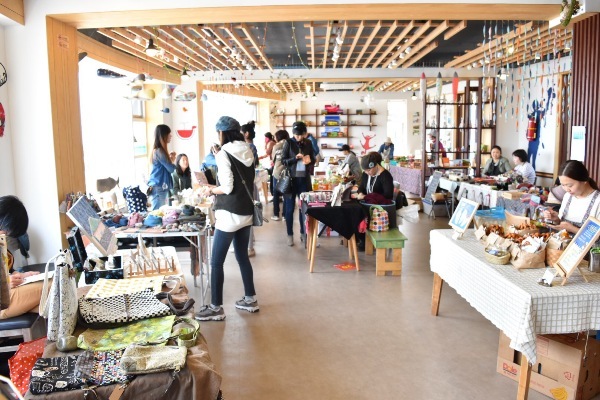 There is, of course, a large hand-craft flea market at Lee Jung-seop Street in Seogwipo but it is hard to be accepted as a seller there. Jeju is a magnet for artists and artisans, and Mr. Yu wanted to set up a cultural environment for them to share their creativity. Occasionally there is live music. Kim Ha-yeong ("Turigongbang") makes haenyeo – Jeju’s women sea divers - dolls to promote Jeju's ancient and famous occupation, and mobiles she calls o-byeong i-eo, five loaves of barley bread (sea shells) and two fish. The loaves-and-fish story from the Bible is used to mean feeding many people. She said she started to make these items as a hobby but it has now become her primary work. Jang Jeong-sun makes pickles and bean paste seasoned with special herbs, and kimchi made with the sauce she prepares from teodeok (like a fat bellflower root), burdock, sweet potatoes or kohlrabi. Shin Mi-yeong says she comes to sell the jewelry she makes but also as a social event where she can meet people and chat. What a joyful few hours schmoozing in such a cordial atmosphere of colorful and delicate craftsmanship with a window wall right on the ocean. Je's Story has coffee, crafts...and something more.